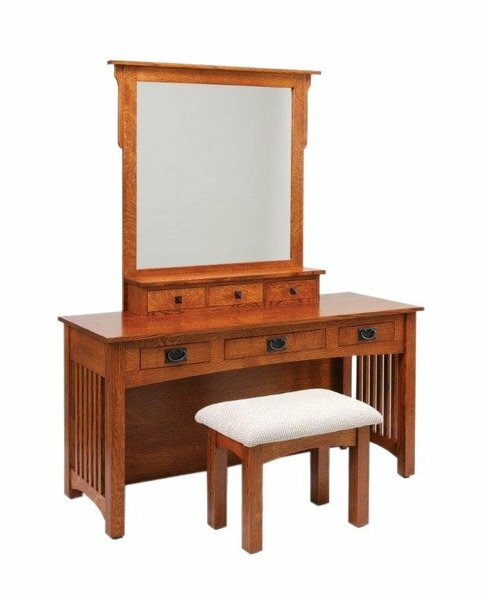 From the clean lines of the top and flush mounted drawers, to the uniform pattern of the slat sides, the classic Mission style is pronounced in every detail of this dressing table. Bench built with three full extension, dovetailed drawers in front and three smaller table top drawers, you can be sure to have room for everything you need to get ready in the morning. And, to ensure you're looking your best, the matching 42" wide mirror will give you just the right reflection when you're getting ready to face the day. Each piece is handcrafted from solid hardwood and finished by a quaint woodshop right in the heart of America! This authentic craftsmanship ensures that your new dressing table is made with an heirloom quality that is sure to be handed down and enjoyed by future generations. Invest in your home with confidence. From start to finish, you pick the details of this beautiful vanity and make sure that it will match your decor. Choose the hardwood and finish and let us build the perfect dressing table for you or that special someone.